This new book published by Dog Ear Publishing is the story of a chandala, one of the lowest of India’s multi-tiered caste system, and the questions that naturally occur as he ponders the reasons for his fate as an “untouchable.” Join Vasu from the first day of his life to the last as he seeks truth and finds beauty in even the most horrifying circumstances. 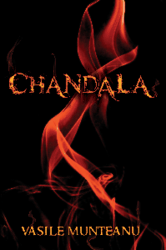 Dog Ear Publishing releases “Chandala” by Vasile Munteanu. 'Chandala' contains breathtakingly beautiful prose that describes heart-wrenchingly pitiful circumstance; Vasu is a fascinating character, simultaneously discontented with and accepting of his fate as a chandala. Vasu began life as every human does, as a naked and crying infant, hungry for milk. However, it soon became apparent that Vasu’s life is very different from those born into a higher caste. Filled with a hunger of both body and mind, Vasu lacks even the most basic necessities in this story; he has no consistent shelter, beyond the occasional tree or under the belly of a mendicant cow. He has no food, beyond what he can obtain through begging, and no possessions apart from the body with which he was born. Despite all of Vasu’s deficits, he is rich in one thing: the desire to understand why he was born into this particular life. Vasu finds a mentor in Soma-Dev, an elderly man who helps Vasu explore his place in the social order. With Soma-Dev, Vasu carefully probes the rationale of the gods who have decided his fate, and eventually comes to terms with the truth of his situation. The two men discuss philosophy and the nature of karma. As time passes, and Vasu is eventually left to his own devices, he continues to ponder his circumstances in a manner that is thoughtful as well as poetic, attuned to beauty despite the starkly ugly nature of his reality. Chandala contains breathtakingly beautiful prose that describes heart-wrenchingly pitiful circumstance; Vasu is a fascinating character, simultaneously discontented with and accepting of his fate as a chandala. Author Vasile Munteanu currently teaches literature and philosophy at the College of Southern Nevada in Las Vegas. Munteanu earned his B.A. and his M.A. in English from Oakland University in Michigan, and his Ph.D. in Philosophy, Interpretation and Culture from SUNY at Binghamton. This is Munteanu’s second novel. For additional information, please visit VMUNTEANU.net.